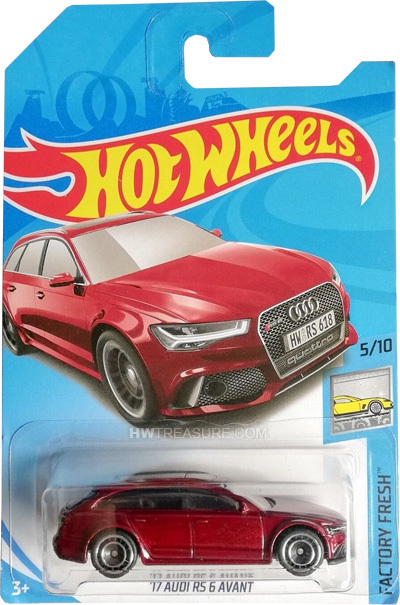 Audi RS 6 is part of the 2018 Super Treasure Hunt set and 5/10 in the Factory Fresh series. It is Spectraflame burgundy with “HW:RS 618” license plates, “RS 6”, and the Audi emblem on the front and back. “quattro” is on the grille and “TH” is on the back. 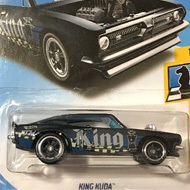 The car has tinted windows, a gray interior, Real Rider wheels, and a dark gray Malaysia base. 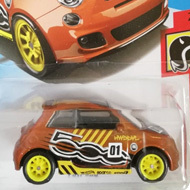 This vehicle can be found in mix “M” of 2018 Hot Wheels mainline cases. The ’17 Audi RS 6 Avant made its debut in the 2018 Factory Fresh series. It is based upon the vehicle that has permanent quattro four wheel drive and a 4.0-liter V8 TFSI engine.